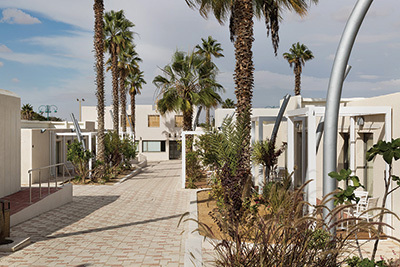 Israel’s first socially conscious hotel, the Desert Iris, is blooming 18 months after it opened its doors in the Negev town of Yeruham. What makes the 47-room hotel with kosher restaurant, bar and spa unique is that at least half of its profits are channeled back into the town to boost local education, culture and sports. And in order to stimulate growth in this once economically depressed desert town, all of the hotel’s 40 employees and many of its suppliers are also from Yeruham or its outskirts. Indeed, the hotel, Yeruham’s first, is getting rave reviews on TripAdvisor and is up to a 70-percent occupancy rate. It cost over $5 million to build, financed in part by the Greater Miami Jewish Federation, and was the brainchild of Yeruham’s past mayor Amram Mitzna. The ex-general and former Labor Party leader now oversees the New Yeruham Fund, the nonprofit organization that owns the property. The Desert Iris features a heated outdoor pool, fitness center, conference rooms, children’s club and bike rentals, with rates starting at $175 a night. 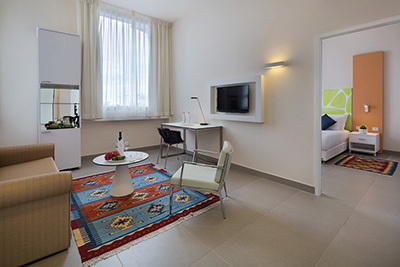 Ground-floor rooms and suites make it suitable for disabled guests. Nearby are several natural and manmade wonders including HaMakhtesh HaGadol (the big crater), the Iris Nature Reserve (from which the hotel derives its name) and Yeruham Lake.